I had decided to bake at least one Brownie per week for my Best Brownie event,but seems like it is not happening.I have bookmarked a few recipes to try within the next few days,lets see if it sees the light of the day!I came across this simple,eggless brownie recipe in Nita Mehta's Eggless Desserts book.After I went through the book at home,I realized I had bought the book only for this recipe.There are many cheesecake recipes[which I am not very fond of] and pudding recipes and there was this brownie recipe with toffee sauce and I got the book,me and my impulsive shopping!! The recipe is a very simple and basic one to start with.It baked beautifully,sans the crust,but still delicious.I did not make the toffee sauce as I had frozen my leftover Toffee sauce from this cake and I felt it would be a great substitute.I had also planned to smear the sauce over the brownie as soon as it came out of the oven,but last minute decided against it.Instead,I refrigerated the Brownie and while serving,warmed both the brownie and the sauce for a delectable dessert. Preheat oven to 200C.Grease and line a rectangular baking tray[or a 8' or 9' square baking pan]. Mix together curd and sugar with a whisk till the sugar dissolves. Add baking powder and baking soda,mix well.Keep aside for 3-4 minutes till bubbles start to appear. Sift together flour and cocoa and add the walnuts and chocolate chips,reserve. Add oil and vanilla to the curd mix and whisk well. Add the flour mix 1 tbsp at a time and mix well to get a thick and smooth batter. [If the batter appears too thick,you can add a tsp or more curd to loosen it]. Pour the mix into the greased pan and level the top with a spatula. [I added blobs of Dulce de Leche as I had some leftover in the fridge,though it can be skipped completely]. Bake at 200C for about 10 minutes and then lower the temperature to 150C and bake for 20-25 minutes or till a toothpick inserted comes out clean. Let the brownie cool in the tray for 5 minutes and then cool in a wire rack for about 30 minutes. Slice and serve with toffee sauce. This brownie is more cakey-like,due to the initial whisking and the addition of baking powder and soda but delicious nevertheless. If you want to avoid the toffee sauce[though I'd highly recommend not to]increase the sugar to make 1 cup of sugar total. Refrigerate the brownie once it is cool to the touch and then warm in the microwave just before serving. 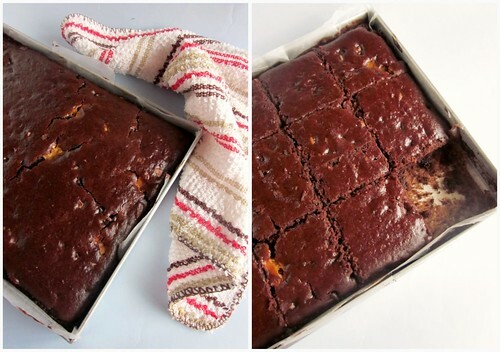 These Brownies are off to my event The Best Brownie Event.Have you sent in your entries yet? Looks really yummy and chocolaty! I have a yoghurt brownie post for your event,will send it soon..
Wow! Brownies with no eggs and no butter! Thanks so much Divya! Must try this when my dairy and egg allergic Nephew is here! I might be able to use soy curd in place of the yogurt! I have a wonderful cake recipe that is quite similar to this. It's awesome so I'm sure these brownies are too! Toffee sauce smeared, egg less and made with oil - fabulous! 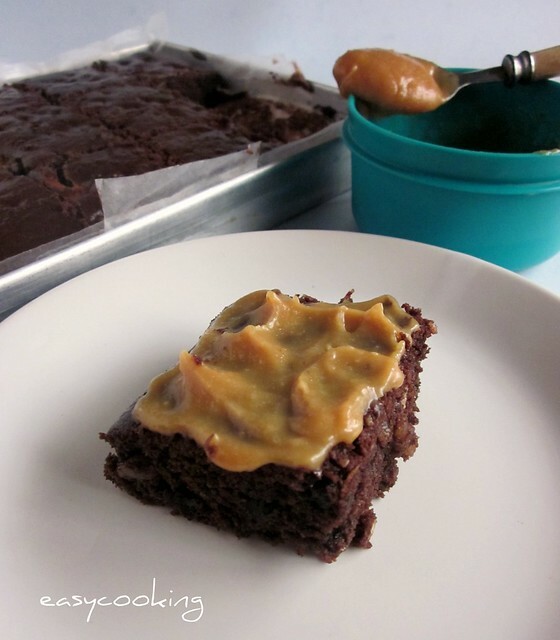 I have been since ever looking out for a good eggless brownie recipe..this one looks too good..bookmarked. looks delicious with the sauce..love the recipe using curd..sounds good..
My search for a good easy to make, eggless brownie recipe ends here!!! Trying out this yummilicious brownie real soon!!! 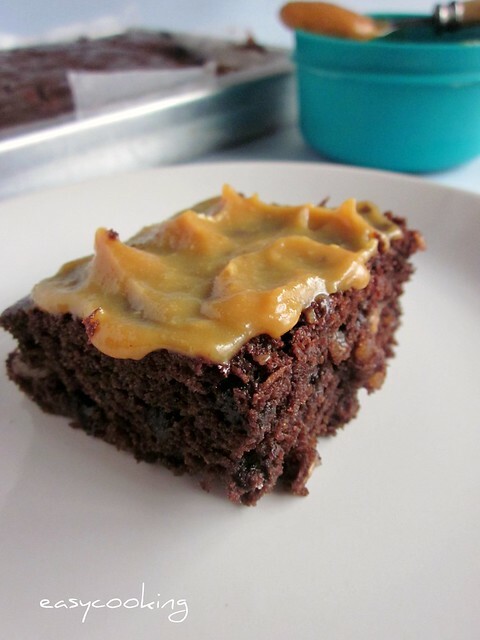 Love that toffee sauce, thats a catchy and inviting eggless brownies..
Those brownies look amazing and very tempting ! Divya..the brownies look FAB!I too own Nita Mehta's book incl. this one. :-) I make the brownies and serve it for dessert normally during the lent season. But never made or had it with toffee sauce.. I'm a lil skeptical because I feel it makes the brownies too sweet?? Does it? Thanks a ton.... it was yummmmy... though was i a hurry to hog on it so did not prepare the toffee sauce... had it with hot chocolate sauce and ice cream, it tasted delicious..!